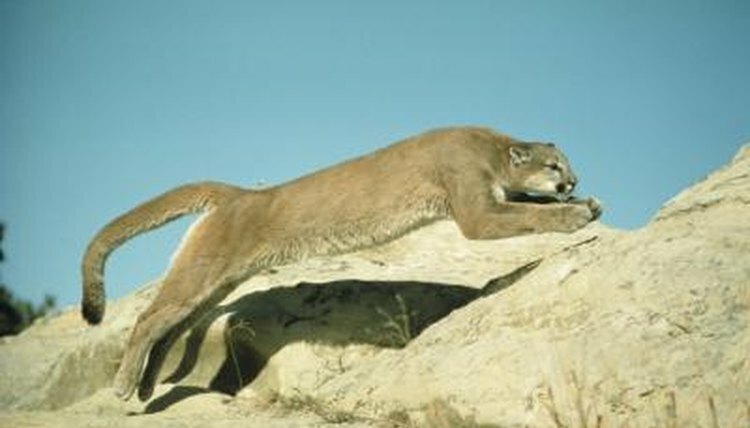 Panthers -- also called cougars, mountain lions, pumas and other names -- live throughout the American West. Versatile athletes, they occupy marshes, deserts, mountains and even suburbs, staking out overlapping territories that encompass 30 to 125 square miles. Although they can run extremely quickly in short bursts, panthers usually hunt by ambush, leaping great distances to attack prey. Panthers can race up to 50 miles per hour for short periods of time. Like cheetahs, their spines are flexible enough to curve while they run, enabling them to hurtle easily around rocks, bushes and anything else in their way. Their ability to shift direction so rapidly helps them outrun and cut off their prey. With a running start, they can leap up to 40 feet. When they’re traveling long distances, panthers can maintain a speed of around 10 miles per hour. In addition to their running speed, panthers have the agility to leap into trees. Their powerful hind legs can propel them 15 to 18 feet off the ground. They also can climb over fences as high as 12 feet. Panthers are adept swimmers, although they usually avoid water. Panthers mostly hunt by stealth, stalking until they’re within 30 feet or so of potential prey, then leaping or using a short burst of speed to take down their meal. Deer make up the staple of panthers’ diets, but they hunt opportunistically and can eat coyotes, beavers, feral hogs, raccoons, rodents and nearly any other animal that appears appetizing. They even prey on porcupines and skunks, and large panthers can kill elk and moose. Panthers are nocturnal and usually solitary hunters, except during mating season and when a mother is teaching her cubs how to bring down prey. As apex predators, panthers play a crucial role in their ecosystems. They keep animal populations from exploding. By chasing herds of deer and elk through various areas, panthers prevent these grazers from decimating grasses, bushes and trees in one spot. This promotes greater natural diversity, preserving foliage that birds, raccoons and other animals need for shelter and food. What Tries to Eat Jaguars? What Does a Tiger Do at Night?